Three fisherman have been dramatically rescued after their trawler lost power in a storm off the Cork coast. The incident happened near Kinsale this evening. 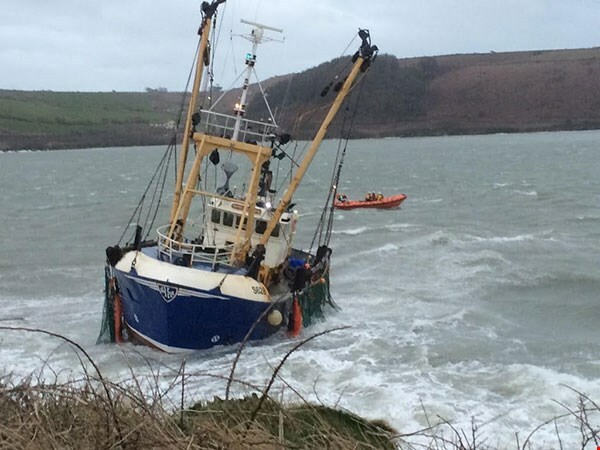 The 20 foot vessel got into difficulty close to the entrance to Kinsale harbour, and the three man crew issued a mayday as she drifted close to rocks. They were forced to abandon the vessel, but were rescued by the local RNLI and coastguard crews, with support from the coastguard helicopter. All three – believed to have been Portuguese – were brought to Kinsale, but were unhurt. Meanwhile, the same storm has led to widespread flooding across the county with flash flooding reported in Skibbereen and some city streets under water again tonight at high tide.